Big Doggie Thinks He's a Cat! Every cat has a little ninja cat in him... you just wouldn't necessarily know it from looking at your kitty. That's because he goes ninja behind you, when you're walking away or not looking. Observe. Now you know what to watch out for! Except that it's cuter -- especially with the Cute-favorite extreme close-up! Welcome to a special (a.k.a. I forgot yesterday) Wednesday edition of Two Cat Tuesday! First, I wanted to tell you guys that Pimp is 100% back to his normal self! No more sick, no more infection, no more ulcers on his tongue. Yay, Pimp! And lastly, Pimp wanted me to take a survey. This is his absolute favorite spot in the house -- on the bathroom counter. 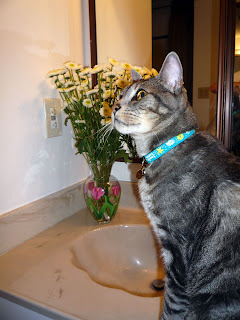 Don't I look handsome by Mom's flowers? He likes the counter so much because he LOVES to drink water from the sink. He'll sit up there for hours if that's how long it takes for me to realize he's there waiting for me to turn it on. Slurp, slurp, slurp! 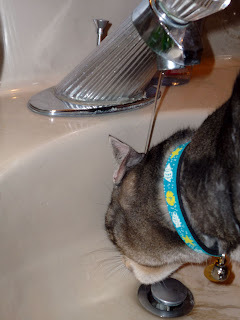 It tastes better in the sink that in my water bowl. So for Pimp's survey: What is you all's favorite spot in your house? Anyone else out there a sink drinker? Next week I'll remember Two Cats Tuesday on Tuesday... Come back then to visit Pimp and Moo again! Note from Cute: Two Cats Tuesday is on hold until tomorrow. We'll have a special Two Cats Wednesday edition! Kitties can be very cute. They can also be very conniving... If you find yourself on the wrong side of the paw, beware. Behold the beautiful, graceful, smooth moves of these furry kitten ballerinas! And not only do they have a beautiful dance troupe (the more meowlerrinas the better! ), but look at that fabulous cat tree they have to dance on. If I was a cat, I'd be dancing, too! What Do You Get When You Mix a Pitbull, a Siamese & Some Baby Chicks? Well, obviously, if this is on the Cute, the answer's simple... A whole lot of loving cuteness! P.S. Have you ever seen a baby chick hatching?